Giant monsters started raining down from the sky and wreaking havoc all over the world. 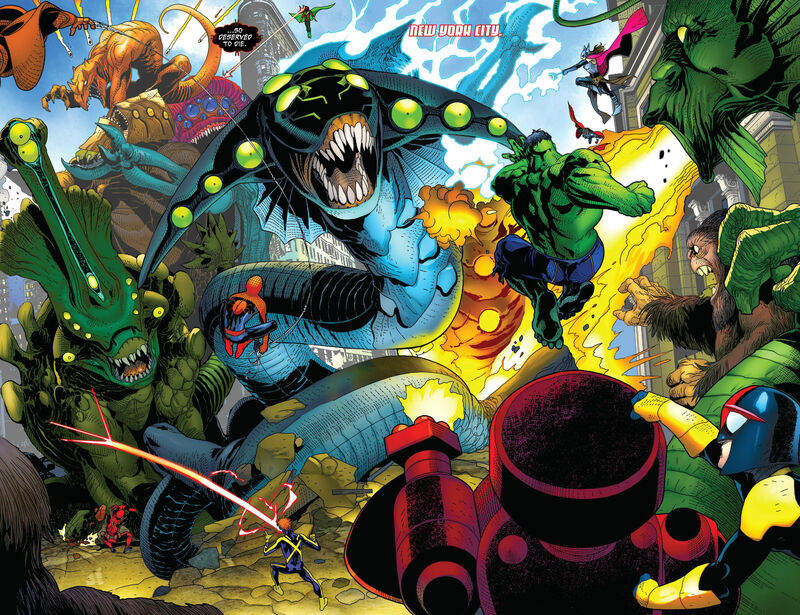 Heroes from all over banded together to take on these gargantuan beasts, But even with the combine might of the Avengers, Champions, X-Men, Inhumans, Guardians of the Galaxy and more was not enough. With the beast coming in like an apocalyptic meteor shower, the heroes have no chance of winning until another group of monsters appear. This group of monsters were called down to help save the world that they themselves have tried to conquer in the past by a boy named Kei Kawade. Kei is a new Inhuman with a power to summon monsters by simply drawing them. During a brief reprieve Kei’s parents tell Kei and the heroes that he is an Inhuman. Hearing this the Inhumans tell everyone of an ancient Inhuman prophecy–that he would be the savior of the beasts who plan on destroying the Earth for their leader the Leviathon Mother. Word reaches the Leviathon Mother of Kei, an Inhuman who can summon his own monsters who do not follow her to battle her army. The Leviathon Mother recalls another Inhuman with such powers, the only being who almost stopped her. Now knowing who and where Kei is she is heading to Earth to stop him as she did his predecessor. 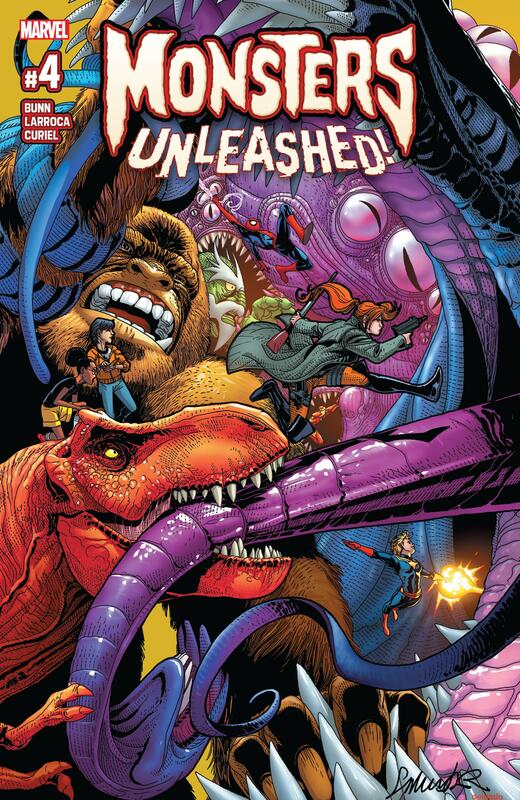 Plot: Leviathons and Goliathons clash as the heroes of the Marvel Universe unite with the monsters that Kei Kawade has summoned to save the planet. Meanwhile another group of heroes protect Kei as he feverishly summons and relocates his monsters to help the heroes. Kei Kawade must become something else, someone else, he must embrace his powers and becomd Kid Kaiju! 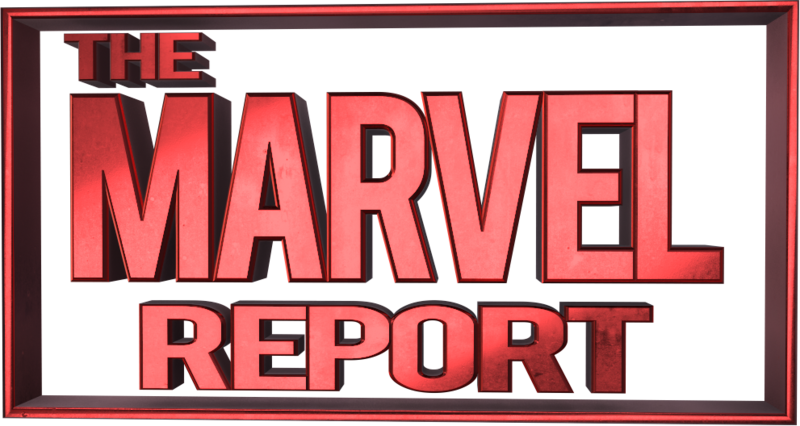 Story: Ok I am going to be honest here, when this event was announced I groaned like a lot of comic book fans that “Marvel is doing ANOTHER event.” I also thought this sounded kind of cornballish. So now here we are 4 issues in and the more I see of Kei, the more endearing he and this story is becoming. 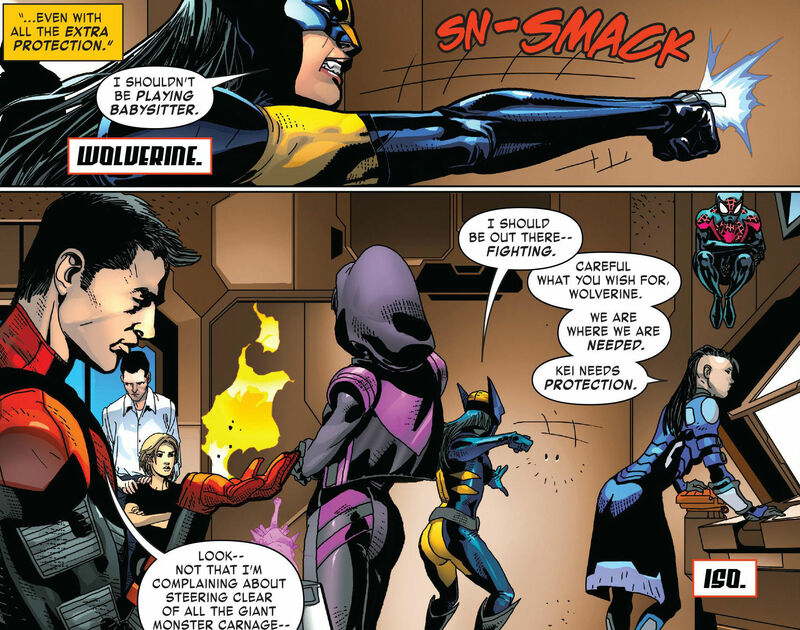 Cullen Bunn has really done more than what I thought this was going to be. I thought “ok giant monsters, this is going to be a cheesey monster fight.” I am glad to say I was utterly wrong. This isn’t even about the monsters, this story is all about Kei. He is a little boy who has the power to summon (at least for now) any monster he draws that already exists. 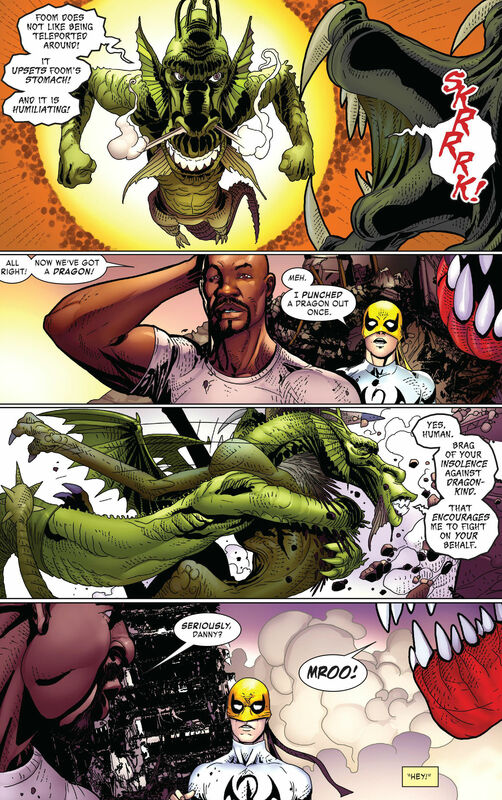 But with Moon Girl (another endearing quality to this mini) suggesting that perhaps he could actually bring to life new monsters that he created is a big game changer and a great premise to launch the ongoing. I think I see a lot of myself in Kei, and I think a lot of other people can as well. I grew up my entire life being into comics. I spent days drawing all I can. I would draw, heroes, villains, monsters, creating my own adventures, imagining them coming to life, and Kei is living that dream within the pages of a comic. This issue really balances the very real threat these monsters present, Bunn is not down playing them at all. The cities are being destroyed. This is a battle that is going to leave scars. But at the same time he is also leaviating that destruction with some well placed, and funny quips. Bunn is the perfect writer for this quirky title that is working its way to one of my favorite Marvel titles out right now. I am excited to see how this mini ends, and how Bunn sets up the ongoing, which he is starting to do now. 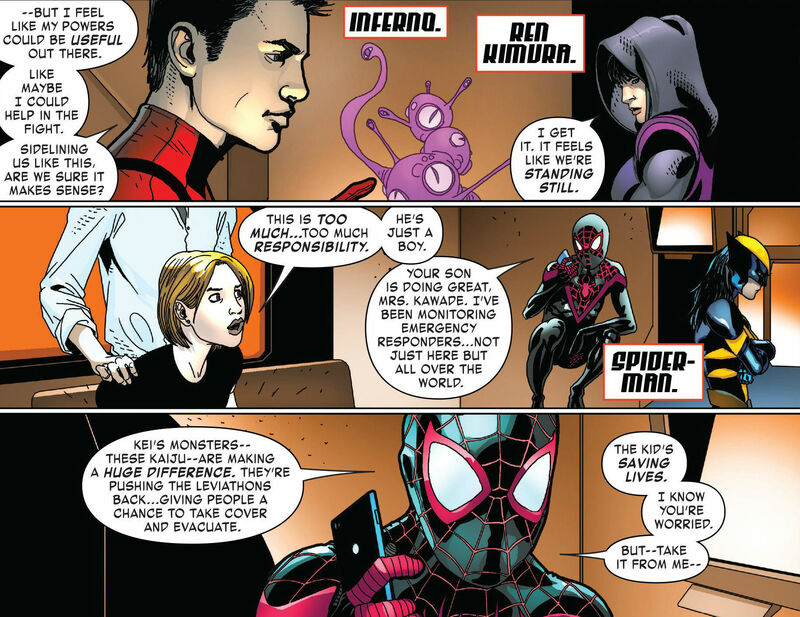 Moon Girl mentions his original monsters, and Spider-Man (Miles Morales) gives him his super hero name Kid Kaiju. The building blocks are all being set up and I am excited to see what Cullen Bunn creates with them. Art: Another thing that worried me was the different artists on this mini. When you read an ongoing, an event, or a mini consistency is appreciated, moreso with a book like this. This is a new idea, a new creation in Kid Kaiju. His world is new to us and the art really helps us to connect or dismiss that world. This mini so far has had four issues and four artists, this could be problematic as each artist has a very unique style. This could have made this new world for Kei fall apart, we have all seen this happen. 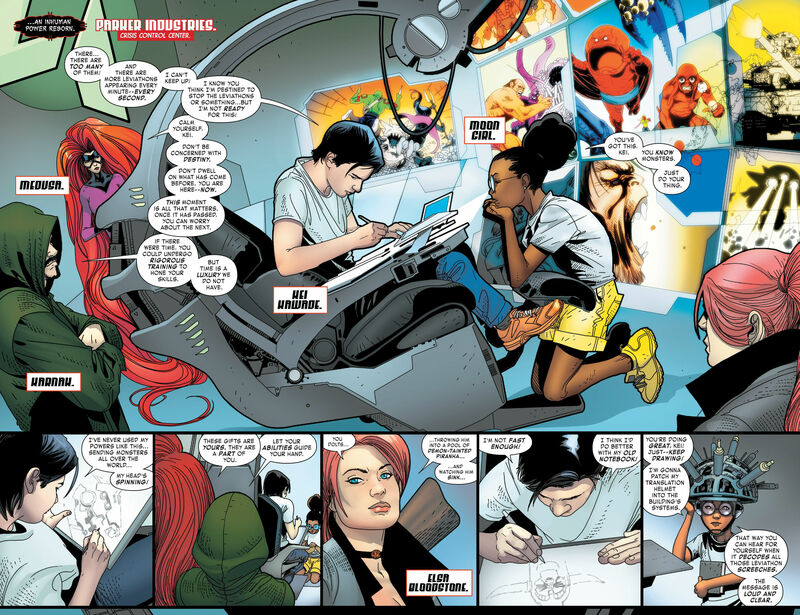 But Marvel has defied the odds and really used each and every artist unique talents to build this world around Kei. Each artist brought a new dimension. Larroca really illustrates the severity here. He took Kei’s situation and really made it more surreal. He brought this threat to a whole new level. The destruction, the chaos, the fear was all brought to life masterfully under Larroca’s art. The colors here added to that. David Curiel selected a pallet that set the tone and allowed Larocca’s art to fully emote. Verdict: Overall, this book really kicked the threat and story up while giving us those deeper emotional entaglements with Kei. If you like the younger energy that Marvel has been producing with the next generation of heroes such as, Moon Girl, Miles Morales, the Champions, and now Kei then you will really enjoy this book as I am and I recommend this to kids of all ages.